Harzer Schmallspurbahnen — permundum. film photography. When I was a teenager and talked about my upcoming travel plans, my grandmother sometimes responded with the above words. A rough translation is "Why look into the distance? See, the good is so close" (thanks Google translator). The words are based on a poem by Goethe called "Erinnerung". Recently, when I went on a day-trip during my visit to Germany, the words popped up in my mind and left me with a smile. I grew up in a small village on the outskirts of Halle (Saale), a city in the southern part of Saxony-Anhalt. Halle is primarily known for being the native town of Georg Friedrich Haendel, a famous baroque composer, and salt harvesting in its early days. Close to Halle, a short drive away, is a mountain range called Harz, Northern Germany's highest mountain range. The highest peak/elevation of the Harz mountain range is called Brocken (~3,747 ft). Both the Harz mountain range and Brocken are great places for hiking and family trips. I recall going on family trips multiple times during my childhood, both with my parents as well as other family members. The part that I liked the most about vacationing there were the day-trips aboard the Harzer Schmallspurbahnen (Harz Narrow Gauge Railway), a steam train network stretching through parts of the Harz mountain range. This past December, when I went home to Germany and the village I grew up in, I couldn't resist going on a day-trip to the Harz mountain range and jump aboard the steam train for a trip up to the peak of the Brocken. Our trip aboard the steam train started in Wernigerode, a small town in the Harz foothills. We arrived early in the moring, around 8 am, at the train station. In the distance we could already hear the steam train slowly approaching that station. Needless to say, I must have stood there with the biggest grin and my eyes wide open. The trip from Wernigerode to the peak of the Brocken took about 2 hours. Slowly the steam locomotive made its way up the mountain to the peak, passing small villages and through the forest. Along the route the steam train made frequent stops for servicing and re-fill of the water tanks; a great opportunity to take photos. 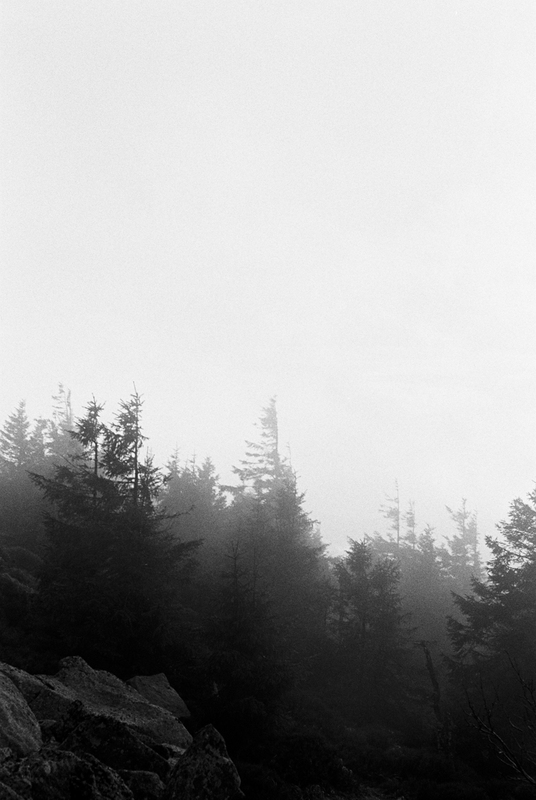 When we arrived at the peak of the mountain, it was wrapped in fog and high winds made it challenging to walk around. We had planned on exploring the views from the peak, but we headed straight for shelter at a small restaurant instead. After a short lunch break we boarded the train for our return trip back to Wernigerode. The trip aboard the steam train brought back many childhood memories, and years later it was still the same fun and excitement to ride aboard the train. Below are a few impressions (photos). All black and white photos were taken with the Leica MP and Zeiss Sonnar 1,5/50 lens on Kodak Tri-x 400 film. All color photos were taken with the Hasselblad 500C and Zeiss 2,8/80 lens on Fuji Pro400H. All photos were developed and scanned by Mein Film Lab.